With such a beautiful day outside, I had to find something to work on the car. I decided to serviced my differential and transfer oil fluid. I have never done it, and apparently, you are supposed to do it every 30,000 or so miles? From watching some videos on youtube, the fluid was very dark after just around 30,000 miles on some cars. So I thought I was well overdue, since I am at 100,000+ miles. To my surprise, my fluid was still clear, I expected it to be very dark. Maybe because of my driving habit, since most of my miles are highway, I do not do a lot of stop and go driving. Super GL-5 80W-90, I could not find it online, so I went to my dealer and got a quart. It is specially made by Penzoil for Nissan ($17/qt). .The service manual calls for 1pt to refill the differential fluid and 5/8pt for the transfer oil. You will need a pump to get the new oil in the differential, since there is a bar in front of the refill hole. I forgot to get one at the store, so I had to squeeze the fluid out of the bottle with a hose attached, not the best way to do it. Also, you will need to remove a small black box held by 1 screw in order to access the refill hole. I did use a breaker bar in order to loosen both screws, they were really tight in there. To refill both the differential and transfer oil, just refill it up to the refill hole. When you see it dripping down the refill hole with the car leveled, that's how you know it is filled, easy enough! The oil is very thick and has a good viscosity, also has a very strong smell. jdedgewood, KBrian, PaulDay and 1 others like this. I just finished replacing the transfer oil fluid today. The transfer oil that came out the transfer gear was very dark, almost similar to when you change your engine oil. By contrast, the oil from the differential came out clean. I will be doing the transfer oil more often (30,000 miles? ), and the differential less often (60,000 miles?). This was more challenging that I thought, but once you figure it out, it should be easy. The transfer oil is located in the middle of the car between the 2 front tires, you access it from the passenger side. You definitely need a pump, I went to Advanced Auto Parts, and got a pump for around $5. You can use any gear oil, as long as it is 80W-90 GL-5, it is the weight that count. I saw the same type of oil at AAP for $8 (Valvoline), the one I got from the dealer was $17, almost 2x as much. The rear differential and the transfer oil use the same type of oil, 1 qt is enough, the transfer oil only needs 5/8pt or 12 oz. Here is the tricky part, there are 2 similar screws on the transfer gear, one at the bottom and one facing the driver's side. I thought the one facing the driver's side was the refill plug (WRONG...). As soon as I unplugged it, the oil started to gush out. I was surprised as the oil is not supposed to come out of the refill plug. But since I already opened it, I let the oil drained. I then open the bottom drain plug to drain the remaining oil. I then tried to find where the refill plug is located, it is located on the side facing the passenger side, on top of the transfer gear. You can barely see it, because there is another screw below it hiding it. 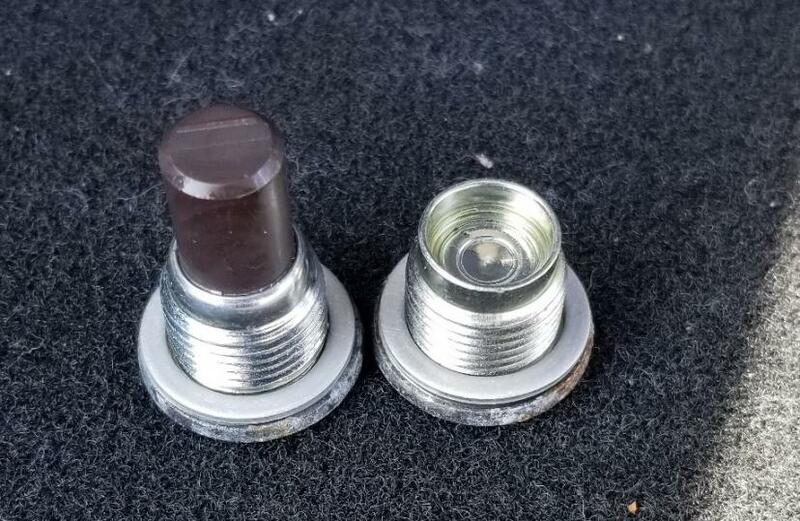 Also the refill plug does not use the same screw as the drain plug, it is a square screw (see picture), you need a wrench small enough to get in there. I noticed right away a smoother ride, and less stuttering going uphill at low speed. jdedgewood and MuranoSL2003 like this.